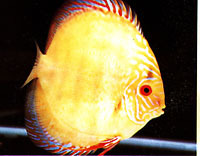 rare and new; the variety available at that time was the "Brown Discus"
variety of Discus successfully bred was the "Brown Discus" in the early sixties. neutral and a conductivity 60 to 80 microsiemens. to cater for their own exports. Known as the Brown Discus (Smyphysodon Aquifasciata Axeldori). 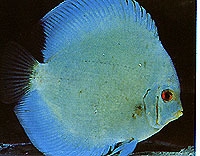 A very red colored Discus of this strain is also found in the wild. Thailand. Still a popular fish among hobbyists. 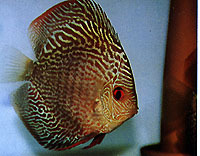 Pidgeon Blood Discus. Photo shows the female tending to the frys. 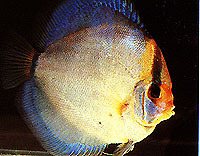 body which can be mistaken as a Pidgeon Blood Discus. The difference is in the eye. of the body. 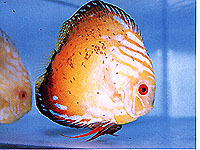 These are progeny of a Heckle and a Brown Discus. expressed but some red spots appeared. attention of Discus breeders and hobbyists frrom far and near. Taiwan and even in China. "Diamond Blue". The above is one of the four colour variants. of this mutant strain produceed within a short period. and the present form is much cleaner looking and has a yellow forehead. the tail end and over the eyes. It was entirely different from the parents.